The main aim of card shuffling is to alter the arrangement of the cards, which are in a deck. Different people have build up different ways of shuffling a deck some time ago. The earlier ways of shuffling were easier, but as time passed, many ways of shuffling came to the forefront. Some of the shuffles are common whereas, some are taken as fancy. This is also based on the country. For instance, in Europe commonly used shuffling method is Overhand shuffle. In USA the method commonly used in the Riffle shuffle. This method is taken as fancy in Europe as many cannot do it. The method of shuffling also depends on the card quality. There are certain groups of shuffles. There are single or two handed shuffling methods. Some groups include false and regular shuffles. The way by which the order is really changed is known as regular shuffles. The techniques by which the deck is left in the identical order or just move and keep some cards in some positions are known as false shuffles. Now, you will find many common shuffles along with some fancy shuffles. All the techniques given here are meant for the right-handed people. Therefore, if you use your left hand, then just turn around the instructions. 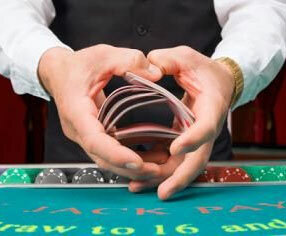 At present, casinos attempt to employ shuffling machines largely. There are pros and cons of the automated shuffles. The early machines were just plastic boxes, in which you can observe the way the cards were riffled because of the clear plastic. The main benefit of this machine was that it got rid of human factor at the time of shuffling and these machines were faster as well. The latest kinds of shuffling machines operate on another kind of principle. These comprises of some smaller boxes within which the cards are distributed. The machine choose a lot randomly for the every card and then it select whether the card will set out on the top or at the bottom of the cards, which are present in the slot. However, in this system it seems as if the cards are entirely random. However, they are actually not. Suppose if you have twenty-six blue and red cards and you place the red ones over the blue cards, moreover, you use this machine, then you will get a pack of blue ones then again a pack of red cards and lastly a pack of blue cards. The computer shuffles does not work with real cards. A few casinos have started to use this technique, so the dealers just need to push buttons. Speed is the main benefit of these systems.